The ship in the picture is “Carina” (you might be able to see the name КАРИНА in cyrillic on her bow). Length: 122m, 7600GRT, 328 passengers. She is currently known as “Rochale One” and operates as a static ship for student accommodation in Amsterdam. She was built in Nantes, France in 1977 for the then Soviet government and named “Aywasowski”. She operated cruises out of the Black Sea and the Mediterranean. 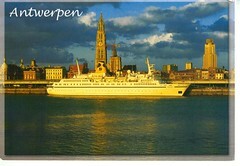 She was renamed Carina after she was bought by German company Phoenix Reisen in 1997. She changed hands again in 2000 and was renamed “Primexpress Island”, operating out of Cyprus. The ship was impounded in the port of Limassol (Cyprus) because of unpaid bills. She was eventually purchased by a consortium of three Dutch housing companies acquired the vessel, towed it to Amsterdam and configured it for use as hotel accommodation for students. Her engines are kept in working order, so she is capable of sailing as and when needed. Thanks for the fascinating postcard, Judit!